The President Wants a Space Force. He Might Get One. Vice President Mike Pence’s speech at the Pentagon laid out what a new US Space Force would do. It’ll cost $8 billion to start. Last year I had a good time comparing Sony’s DPT-RP1 with the home-grown reMarkable. They both had their strengths and weaknesses, and one of the Sony’s was that the thing was just plain big. They’ve remedied that with a much smaller sibling, the DPT-CP1, and it’s just as useful as I expected. Which is to say: in a very specific way. Sony’s e-paper tablets are single-minded little gadgets: all they do is let you read and lightly mark up PDFs. If that sounds a mite too limited to you, you’re not the target demographic. But lots of people — including me — have to wade through tons of PDFs and it’s a pain to do so on a desktop or laptop. Who wants to read Amazon’s Antitrust Paradox by hitting the down arrow 500 times? 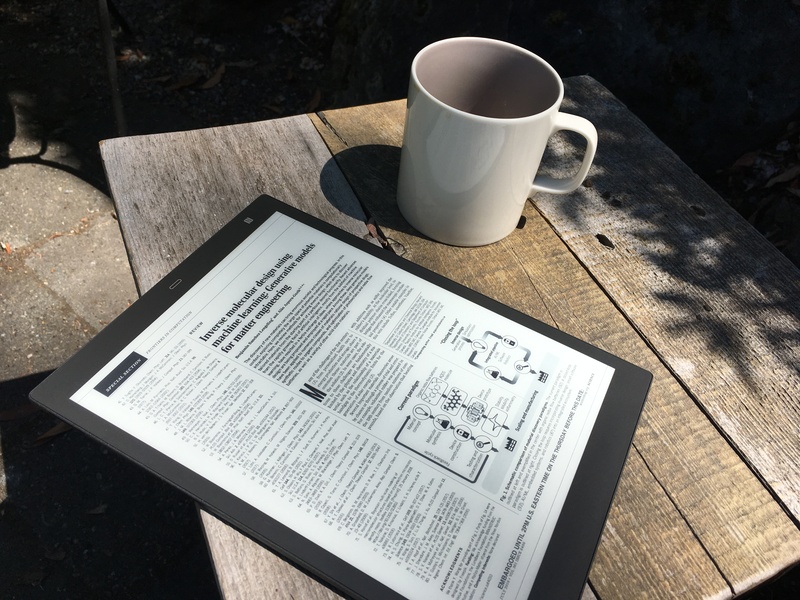 For legal documents and scientific journal articles, which I read a lot of, a big e-paper tablet is fantastic. But the truth is that the RP1, with its 13.3″ screen, was simply too big to carry around most of the time. The device is quite light, but took up too much space. So I was excited to check out the CP1, which really is just a smaller version of the same thing. To be honest, there’s not much I can add to my original review of the RP1: it handles PDFs easily, and now with improved page jumping and tagging, it’s easier to navigate them. And using the stylus, you can make some limited markup — but don’t try to do much more than mark a passage with an “OK” or a little star (one of several symbols the device recognizes and tracks the location of). It’s incredibly light and thin, and feels flexible and durable as well — not a fragile device at all. Its design is understated and functional. Writing isn’t the Sony tablets’ strong suit — that would be the reMarkable’s territory. While looping out a circle or striking through a passage is just fine, handwritten notes are a pain. The resolution, accuracy and latency of the writing implement are as far as I can tell exactly as they were on the larger Sony tablet, which makes sense — the CP1 basically is a cutout of the same display and guts. PDFs display nicely, and the grid pattern on the screen isn’t noticeable for the most part. Contrast isn’t as good as the latest Kindles or Kobos (shots in the gallery above aren’t really flattering, since they’re so close up, but you get the idea), but it’s more than adequate and it beats reading a big PDF on a small screen like those on your laptop’s LCD. Battery life is excellent — it’ll go through hundreds of pages on a charge. A new mobile app supposedly makes transferring documents to the CP1 easy, but in reality I never found a reason to use it. I so rarely download PDFs — the only format the tablet reads — on my phone or tablet that it just didn’t make sense for me. Perhaps I could swap a few over that are already on my iPad, but it just didn’t strike me as particularly practical except perhaps in a few situations where my computer isn’t available. But that’s just me — people who work more from their phones might find this much more useful. Although I value its simplicity, it really could use a bit more functionality. A note-taking app that works with a Bluetooth keyboard, for instance, or synchronizing with your Simplenote or Pocket account. The reMarkable is still limited as well, but its excellent stylus (suitable for sketching) and cloud service help justify the price. I have to send this thing back now, which is a shame because it’s definitely a handy device. Of course, the $600 price tag makes it rather a niche one as well — but perhaps it’s the kind of thing that fills out the budget of an IT upgrade or grant proposal. Card readers used by popular companies like Square and PayPal have several security flaws that could result in customers getting majorly ripped off. Adam Pittenger knows that moving is tough — after all, he said he’s moved eight times in the past seven years. Pittenger said that there are several reasons why the process can be stressful, like the fact that most people aren’t experts on moving, since they don’t do it as often as him (seriously, eight times is crazy). Plus, there’s just an enormous amount of planning and coordination required, whether it’s hiring movers, buying packing materials or putting your things into storage. Moved is announcing that it’s raised $3.2 million in seed funding from Lowe’s Ventures (the early-stage investment arm of the home improvement giant), FJ Labs, AngelPad, Real Estate Technology Ventures and others. To sign up for Moved, you fill out a questionnaire about where you’re moving to and from, and what kinds of services you need. Moved (available via desktop web or mobile app) will then reach out to movers and provide you with multiple quotes from which you can choose. And while, as Pittenger put it, “the immediate thing you need to do is book the movers,” Moved offers a broader range of services, like ordering packing supplies, helping you donate stuff you don’t need anymore, finding a storage unit, updating your address, finding painters and more. Moving can also be expensive, so the company has announced a partnership with Affirm, where Affirm’s financing will allow you to break up the moving costs into monthly payments. To be clear, Moved isn’t doing the moving itself — instead, it’s basically connecting you to a marketplace of movers and other service providers. Pittenger said the company is “very strict about the suppliers and the vendors” and will remove them if customers aren’t happy with their experience. Moved is managing all of this through a real, human assistant who can help you figure out what you need, handle the scheduling and serve as a “consumer advocate” who ensures that you’re not getting ripped off. Pittenger said the service is free for consumers, with a fee charged to vendors at the time of booking. And it’s available throughout the United States. Silicon Valley engineers have the power to shape products and companies—both of which have enormous impact on our society. Internet service provider Starry announced today the launch of its Starry Connect program with a pilot through Boston Housing Authority (BHA) to help provide free access to internet for residents living in one of the city’s public housing apartment complexes. The Boston-based startup launched in 2016 with a plan to provide internet access through a spoke-and-wheel system of transmitters and access points. This point-to-multipoint system uses a phased array laser on top of a city building to send a 5G signal out that users can connect to via Starry Points that can be installed at a window or personal roof. With the program Starry launched today, residents of the public housing apartment building will be able to access free Wi-Fi in the building’s common area, hallways and new computer lab. Virginia Lam Abrams, Starry senior vice president of communications and government relations, told TechCrunch that some residents may also be able to access the signal in their rooms, but the primary focus for this installation is to provide common area access for these primarily elderly and disabled residents. Because Starry Connect’s pilot launch in the BHA building is part of the Boston public housing system, residents will receive free connection, but Starry also has plans to provide low-cost pricing options for residents living in affordable housing, as well. The program has no set end date, says Abrams, but the company has plans to check in with residents in a few months to see where the program is succeeding and where it can be improved. Following this initial pilot launch, Abrams says that Starry has hopes to expand into other BHA communities, as well as public and affordable housing in other U.S. cities. Since its launch, the startup has expanded into Los Angeles and Washington, D.C., and following a $100,000 million funding round it closed this July, has plans to scale and expand into more cities in the coming year, including Houston, Chicago, San Francisco and Portland, Ore. It may seem strange to worry about the future of broadcast in this digital era, but the fact remains: that’s how many people get their news.